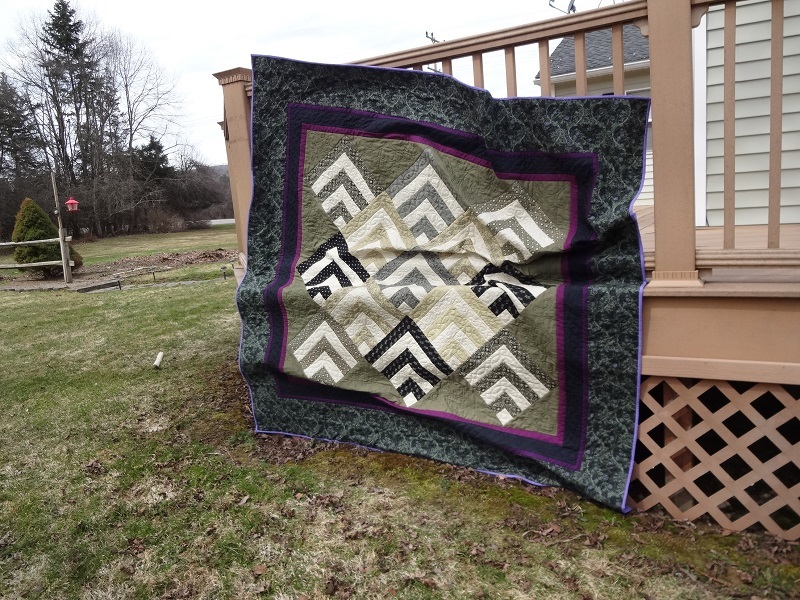 I put the final hand stitch in the binding of Marrakesh this morning, and wasted no time getting a few photos while we had dry, partly sunny, and very windy weather. Warning, photo-heavy post follows! 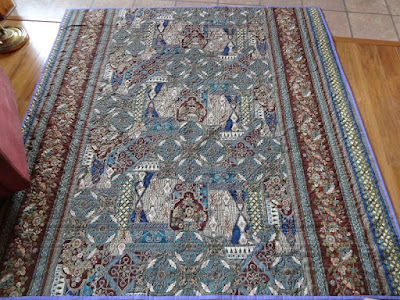 Marrakesh is destined for the annual benefit auction for the church camp, held over Labor Day weekend. 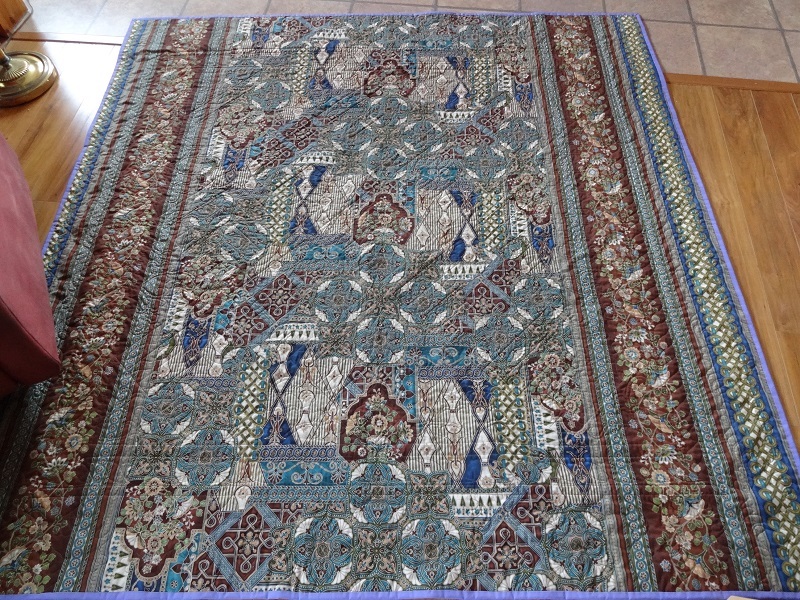 After washing it measures 72x70 inches. These photos were taken before washing out all the stencil markings, so some might still be visible to eagle eyes. A bit closer look at the stencils used for the central portion. 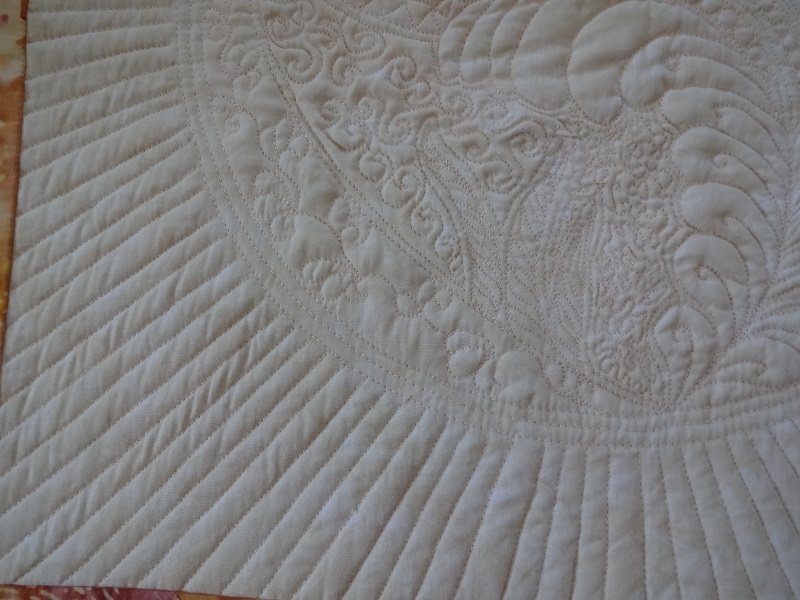 Though I used stencils for most of the quilt, the outer border was quilted with freehand feathers, three on each curve. 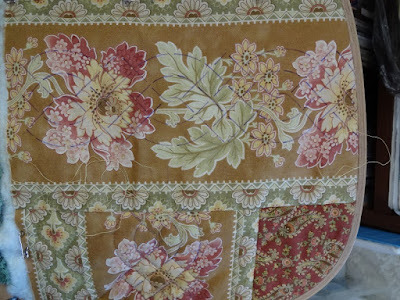 Barely visible on the front, you might be able to see the quilting on the back a little better. Moving outside, we were experiencing strong wind gusts all day, though the temperature rose to the low 70s!! Since it wasn't snowing or raining, some outside photos seemed like a good idea even though the yard was a tad muddy and more than a little drab. Second attempt at keeping it over the rail until I could snap a picture. Ha! Caught mid-fall. Couldn't resist posting this one! 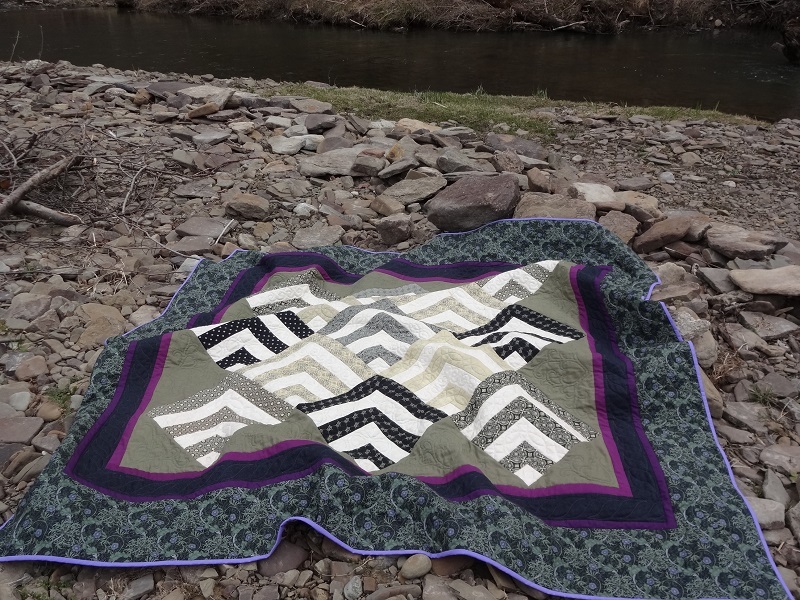 We (the quilt and I) wandered back by the creek. A lull in the wind made it fairly safe to shoot a couple quick photos on the rocks left by the winter floods/ice jams. Every spring it's like a new shoreline along the creek, with plenty of new fossil rocks for the finding. We have yet to find an arrowhead or any evidence of earlier Native American occupation here, though it seems like it would have been a great hunting area with all the wildlife, especially deer, that we see on a frequent basis. And some miscellaneous photos of every blooming thing I could find while hiking the fields. 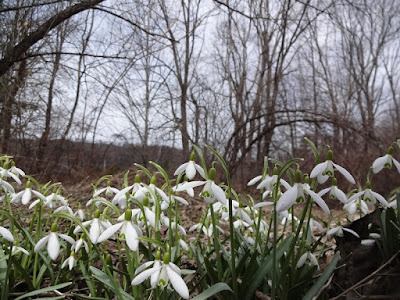 Snowdrops at creek's edge, no doubt replanted during a flood some years back. 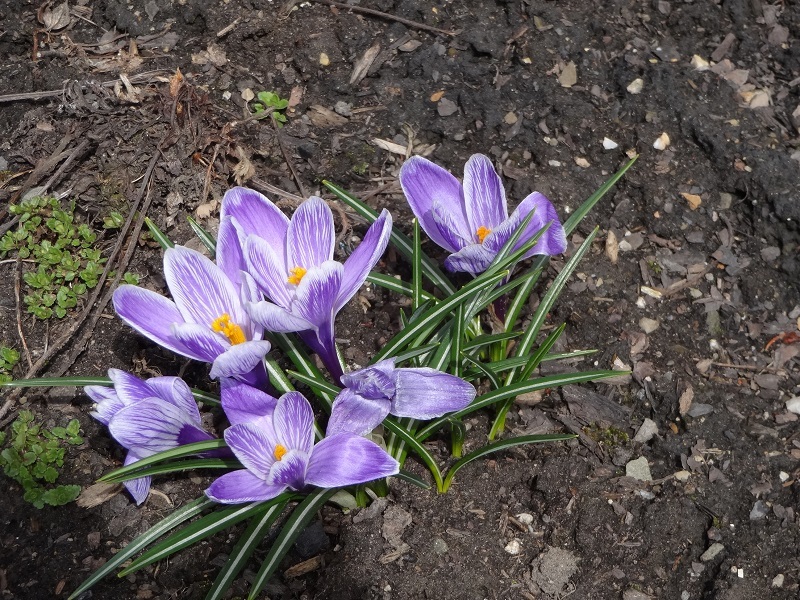 Thinking of moving them closer to the house when they finish blooming. 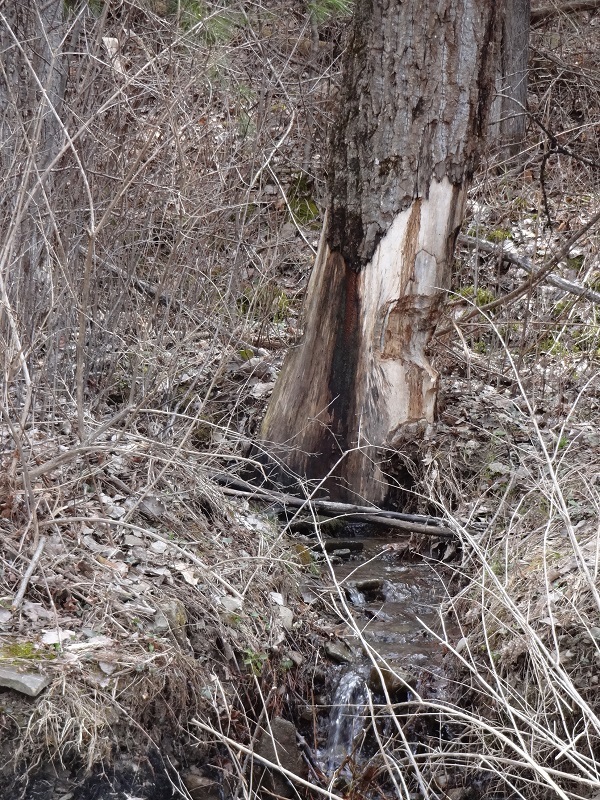 This spot was covered with remnants of last winter's ice jam just a couple weeks back. 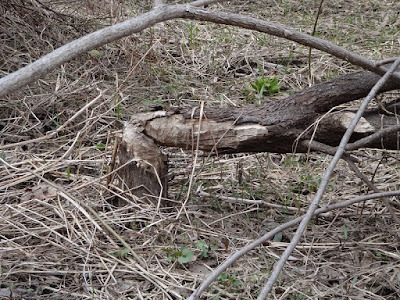 The beavers aren't far away. 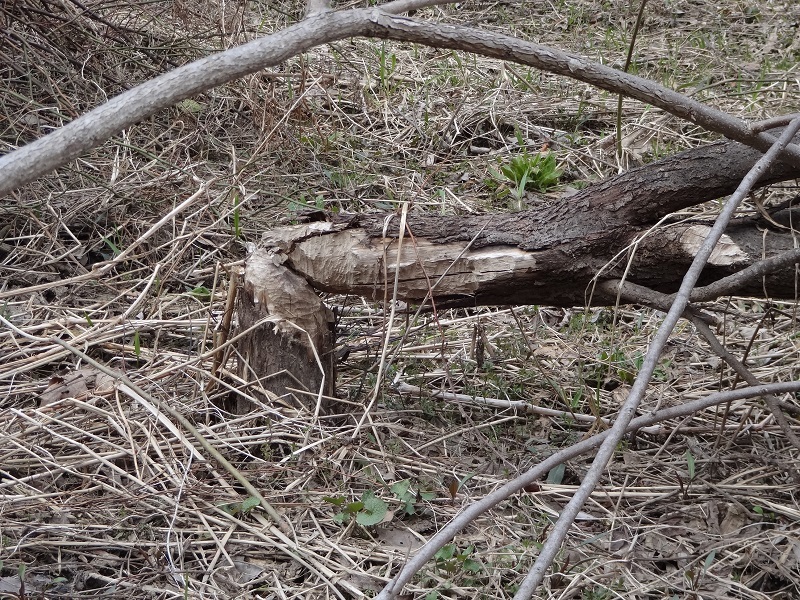 Looking across the creek, more beaver damage to three adjacent trees, this one being the worst. Between beaver damage and that mountain spring/stream cutting into the soil at it's base, we will no doubt lose it in the next year or so. Nature rules! After a soaking rain this afternoon, we're hoping for another partly sunny day in the mid-60s tomorrow. I for one sure hope the snow has left for the season! Linking with Wendy's Peacock Party. Turning the corner - on winter? Maybe, we awoke to "only" half an inch of new snow today. Must be April! Turning another corner today, as I begin the hand quilting on the final border of the basket quilt that has been in the works for at least four years now. 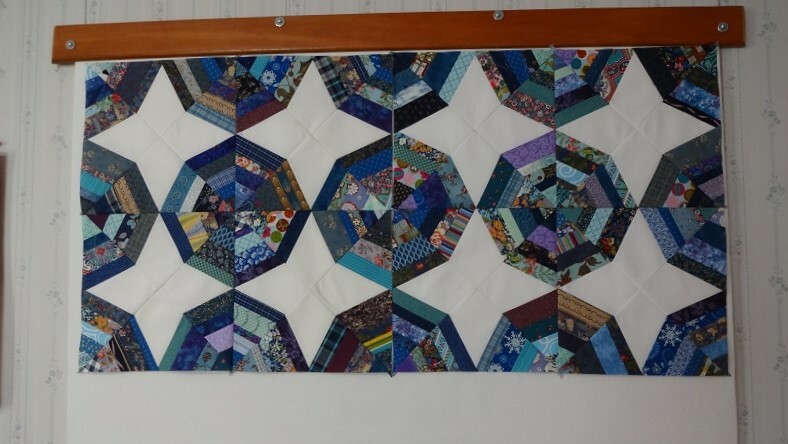 It has been a really positive incentive to post a goal each month since I began linking with Elm Street Quilt's One Monthly Goal for about six months. This month, my hope is to finish the remaining hand quilting on the basket quilt. A fabulous bonus would be to have the binding completed too. Here's hoping! Waiting til the last minute as usual, Sing the Blues Mama Lou has doubled in size this month with the addition of four more blocks. 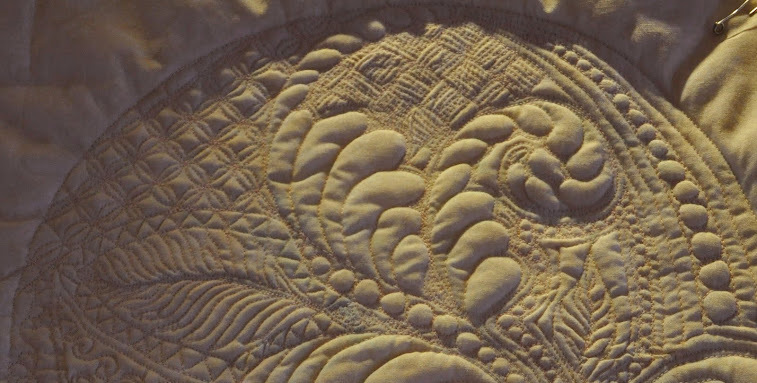 A bit like looking down on a group of parasols marching along, maybe? I'm undecided at the moment whether to make just two more sets of four blocks, then add a small white border and a blue piano-key border and call it done, or to add four more sets of blocks and a border which will make it a good size throw quilt (or tablecloth - for photography purposes only in this house!). These blocks do seem a bit tedious while under construction but I'm loving the end result! And I've seen so many string ideas that I'd like to pursue I'm very tempted to make the smaller version of this one and then head down yet another squirrel trail. Linking with Lori at Humble Quilts Stringalong 2019. Lori is such a wonderful enabler isn't she! My goal for March was to find/piece a backing for the quarter log cabin block quilt and hopefully to begin the quilting. Happy to report that I achieved both parts of that goal! 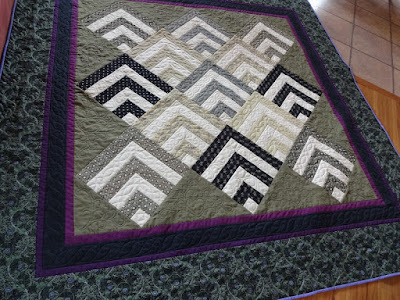 After going through the entire stash I settled on these two coordinating prints for the backing, which actually merged together rather well I think, and inspired the name for this quilt. These fabrics have been around for a few years, as you might guess. That olive green fabric used in the setting triangles has given me fits from the start with stretching even after being starched, so I began by quilting them into some sort of submission (I hope!). And that is as far as the quilting has progressed as of today. I have every hope of completing the quilting and getting the binding on during April, though yard cleanup and spring cleaning may end up taking a bit more time than I'd like, weather providing. It's still cold and windy here, and remnants of the ice slabs the creek deposited on the yard in January still remain. They will melt, one of these days, right? 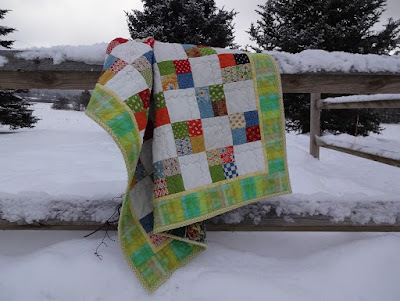 Linking up with Elm Street Quilts One Monthly Goal for March. Some would say it's bordering on madness to reach into a large heap of unfinished FMQ practice pieces from seven years ago to find the makings of a mini, but that's what happened here this month. 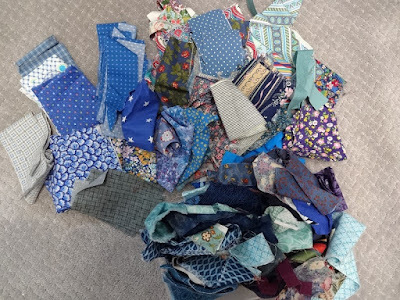 There's this trash bag filled with bits and pieces of things that just couldn't be thrown way when we made our cross country move back in 2014, and they had already been hanging around the sewing room for a couple years at that point. Most all were stitched during the year-long 2012 FMQ Challenge hosted by SewCalGal (now QuiltShopGal), either as a monthly practice piece or merely doodling. That big bag is in the way each and every time I need to empty the stash closet searching for the piece of fabric needed for a project. So, it's now or never, either make something of them or pitch them out! Some of the remaining FMQ practice pieces, ranging from mug rug to placemat size. So, why on earth continue to save them? I guess the best answer is because I don't often quilt these tiny filler designs anymore, since most of my quilts are bed size and I prefer less quilting for a softer finish. Yet, they represent a lot of work in that year of following along with the challenge, and I just can't bring myself to let them go. 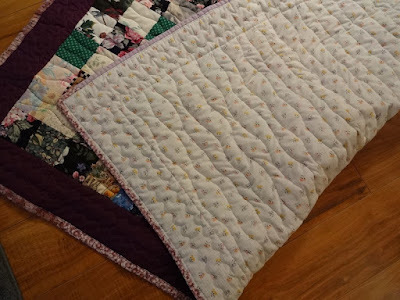 Many of the scrappier pieces were either tossed or made into kitty quilts several years ago. Anyhow, I chose this piece from the June 2012 challenge by Cindy Needham for this month's mini. Yep, you've seen it before, the never-been-changed header photo since this blog's beginning, in all it's unfinished glory. 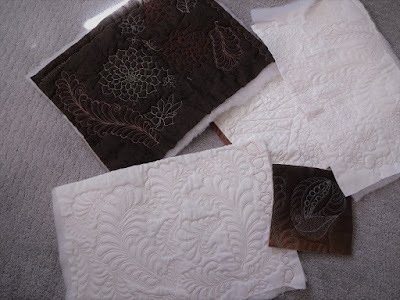 This was the very first quilting project I attempted with my then-brand-new Janome 7700. You can see the original post about it here. 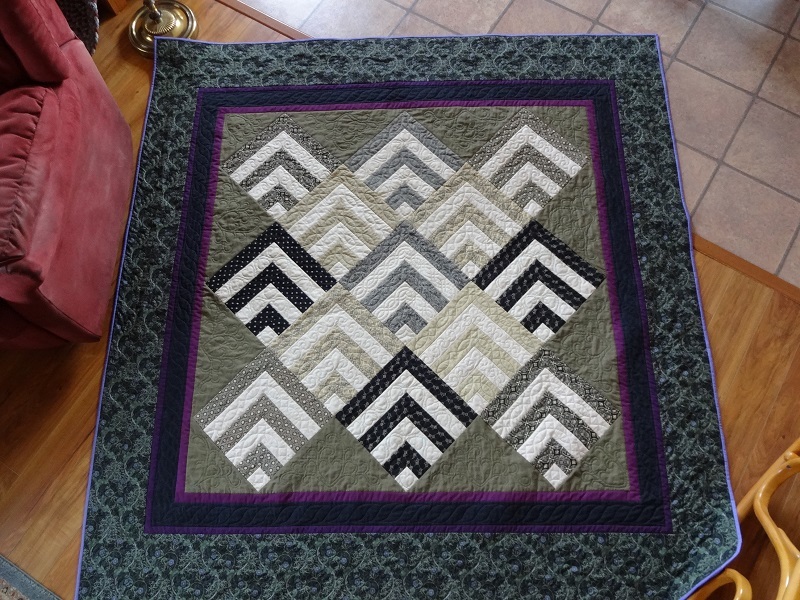 Fast-forward to today, and here is my long-last finished mini quilt. 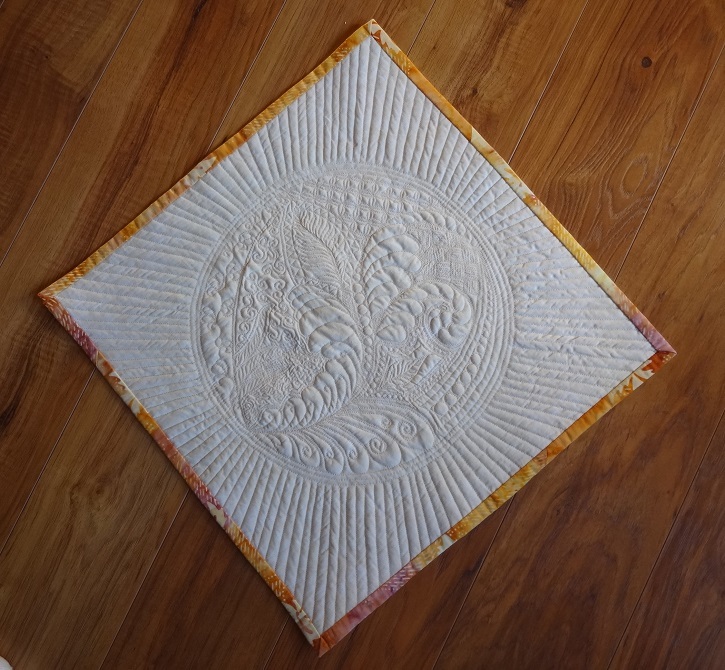 The finished quilt measures 15 inches square. 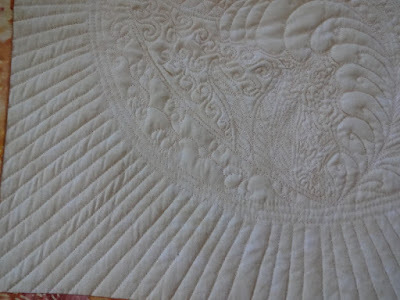 I echo quilted the original circle several times, then finished off with many radiating lines out to the edges. 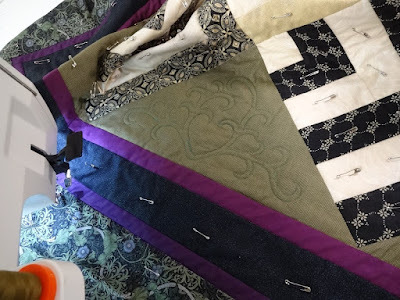 Then since I dislike the look of travel stitching and my eyesight doesn't allow it anyway, there were a LOT of ends to tie off and bury - each one of those radiating lines representing a new start and stop at the edge! I decided to finish this as a companion piece to Menorah, another practice piece from 2012 that was completed last fall. I was so happy with the gold batik binding on that one that I repeated it on the current mini. The robins and red-wing blackbirds arrived last week, proving once again that spring is coming, whether we like it or not! 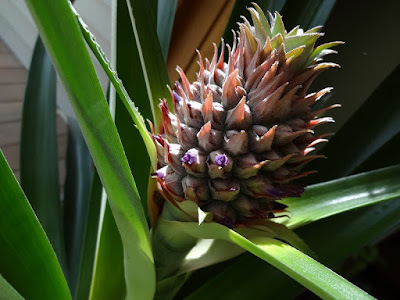 And it snowed a couple inches last night ... And the pineapple continues to head skyward on its stout stalk, its tiny purple blooms just beginning to open. Linking up with Wendy's Peacock Party. Over the weekend this little child's quilt found its way to the finished pile and will be donated for our quilt ministry. 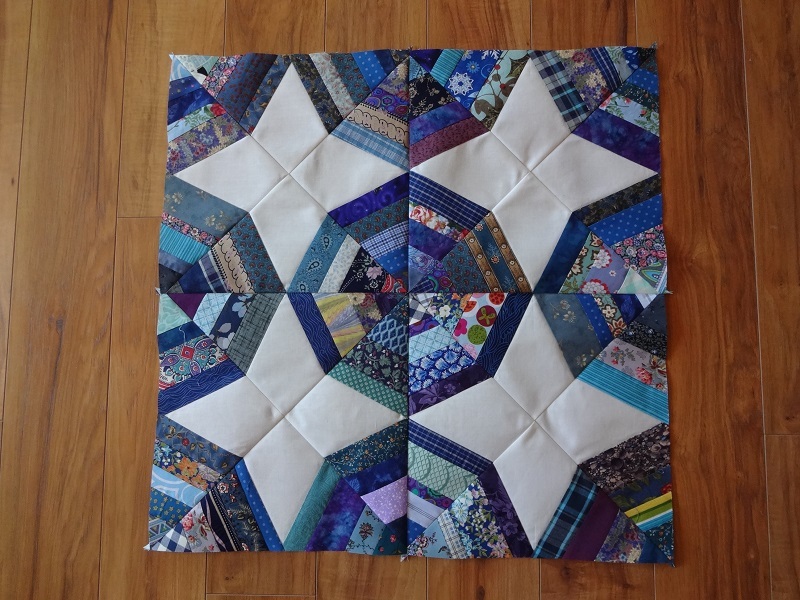 A very straight-forward little leader and ender project, the four-patches were made while piecing the star units for the Christmas top completed a few weeks back. 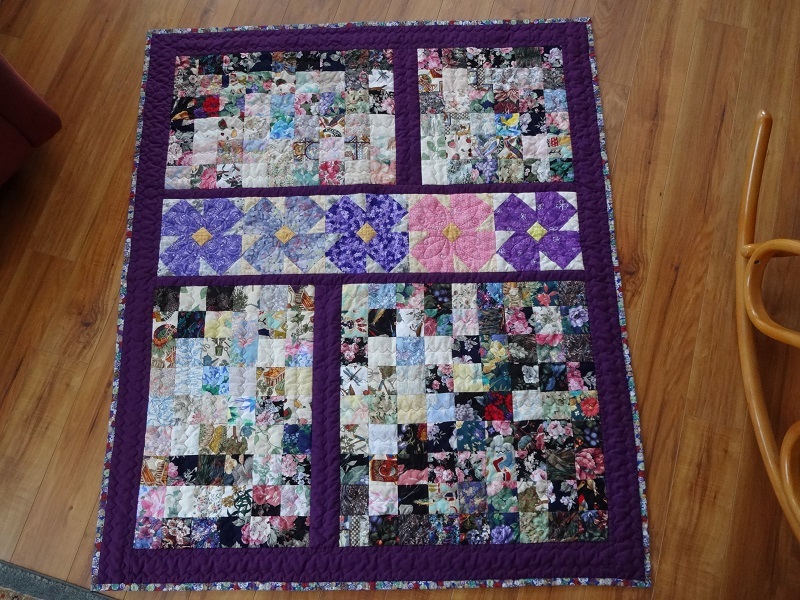 The four-patches are made from three packs of 2-1/2 inch squares I received several years ago. 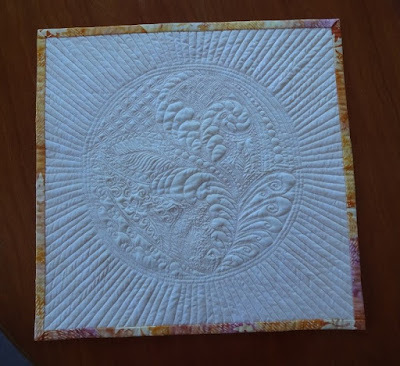 The original plan was to make place mats for some of the grandchildren, but that never happened, and I'm on a quest this year to divest myself of some of the excess stash that has just been sitting around, especially the little precuts that seem never enough to make anything substantial. A new-to-me stencil was quilted in the outer border. 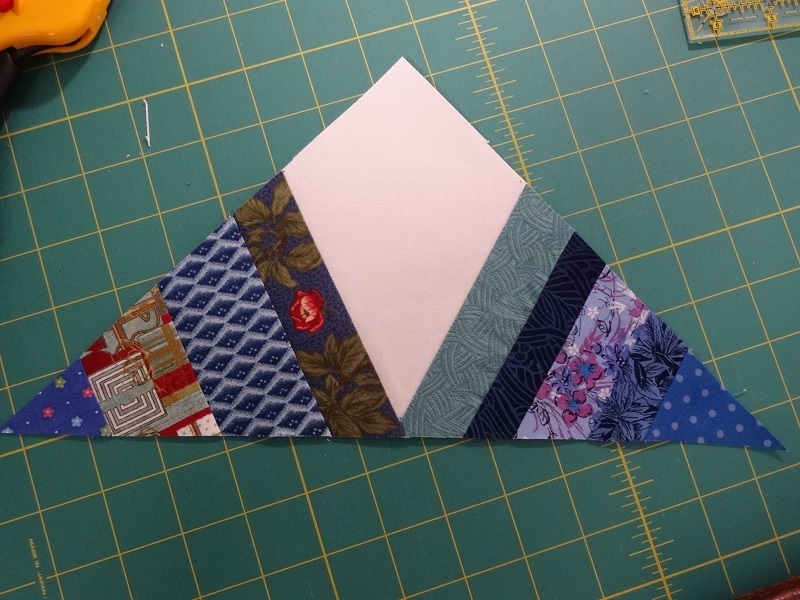 I think this stencil will make an excellent practice motif for our newer free-motion quilters, great practice for smooth curves, and fills a fairly narrow border nicely. I think this one will get a lot of use! 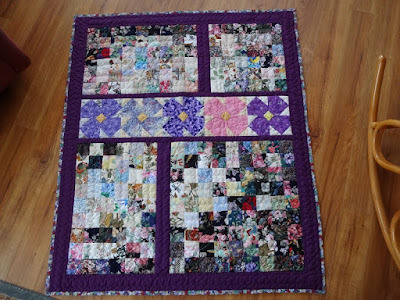 The backing was made up of leftover fabrics from a baby quilt made nearly ten years ago for our oldest granddaughter. After completing three quilts over the last week for our ministry's quilt 'pantry' my plan is to move on this month to starting a couple quilts for the yearly camp benefit auction which happens each Labor Day weekend. 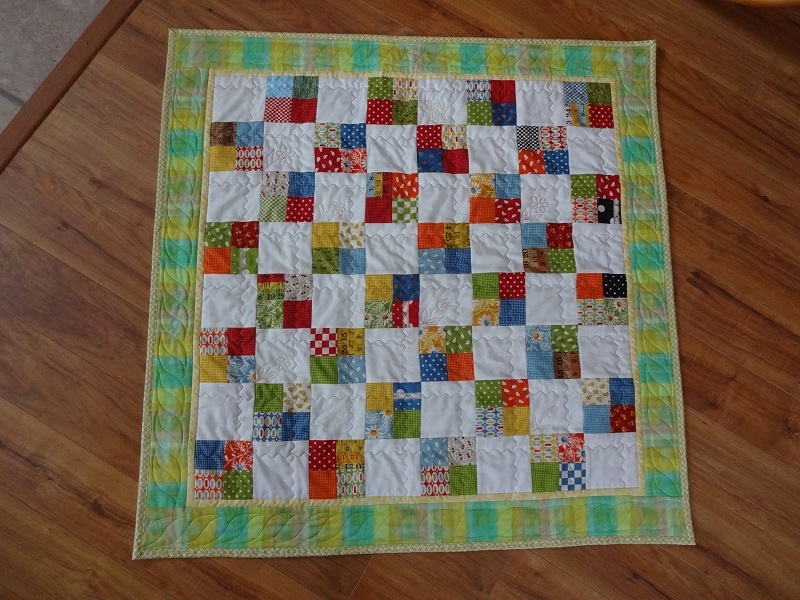 Luckily the first flimsy was already finished last fall and has been awaiting quilting for several months. 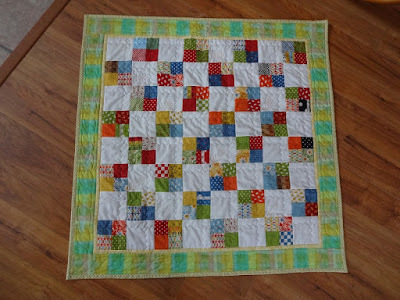 Early last fall I was given several blocks and enough coordinating fabric to complete 13 total blocks. 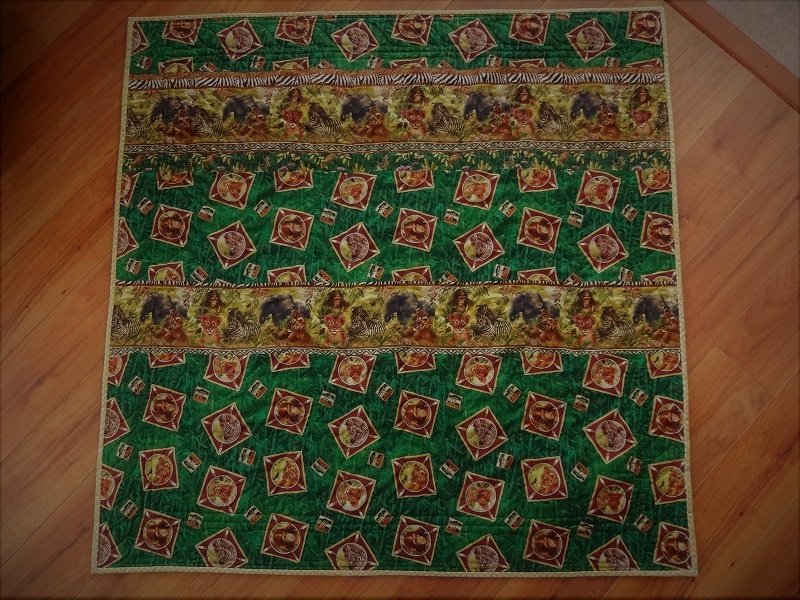 After going through my stash the blocks eventually became this top. 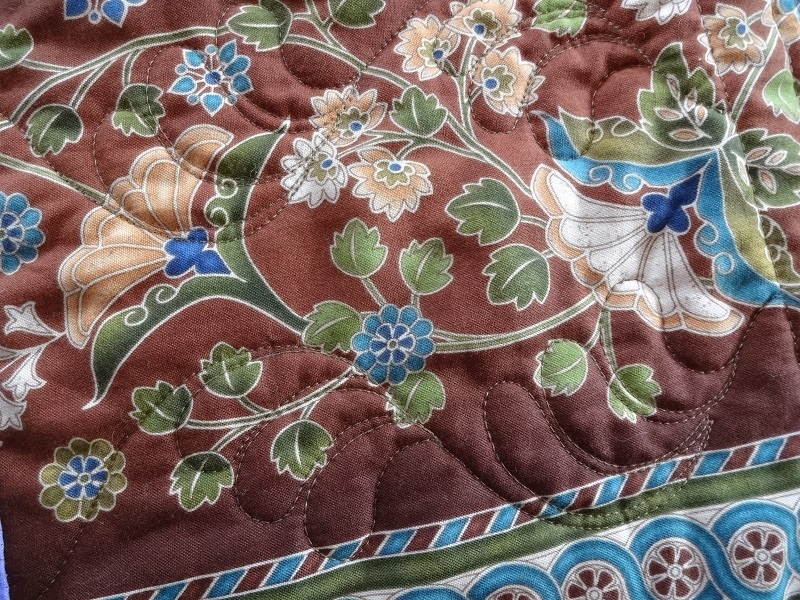 My goal for March will be to find suitable backing and binding fabrics, and at least have the quilt sandwiched and perhaps partially quilted by the end of the month. 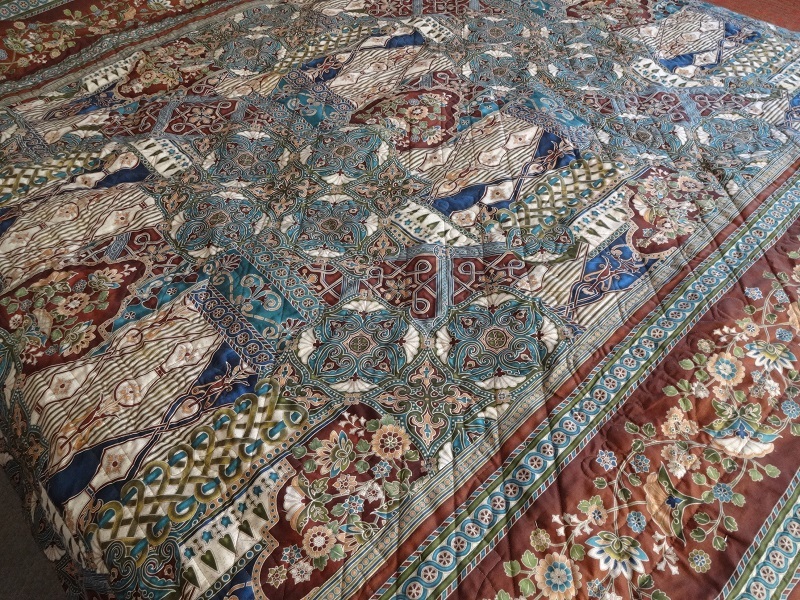 It should make a good size throw quilt as the top measures 70 inches square. Linking up with Elm Street Quilts where Patty graciously hosts the One Monthly Goal challenge each month. We seem to have missed the brunt of the latest storm, for which everyone around here is breathing a sigh of relief. Winter does seem rather never-ending this year doesn't it? Between snow showers early this morning I managed to snap this quick photo, though the camera and I didn't stay outside for long as the temperature was still in the teens. 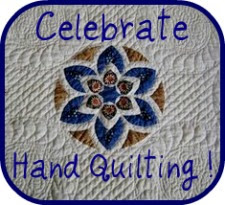 Happy Monday stitching, and I hope you are seeing signs of spring where you live! So here it is, the end of February, it's (still) snowing, with lots more predicted for the first Marching in Like a Lion weekend, sigh. 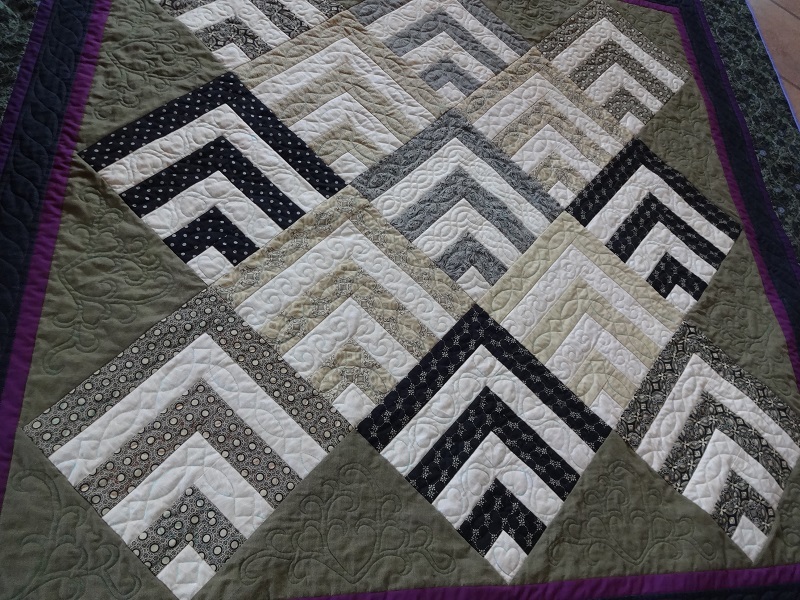 Nothing to do but keep on quilting, hehe! 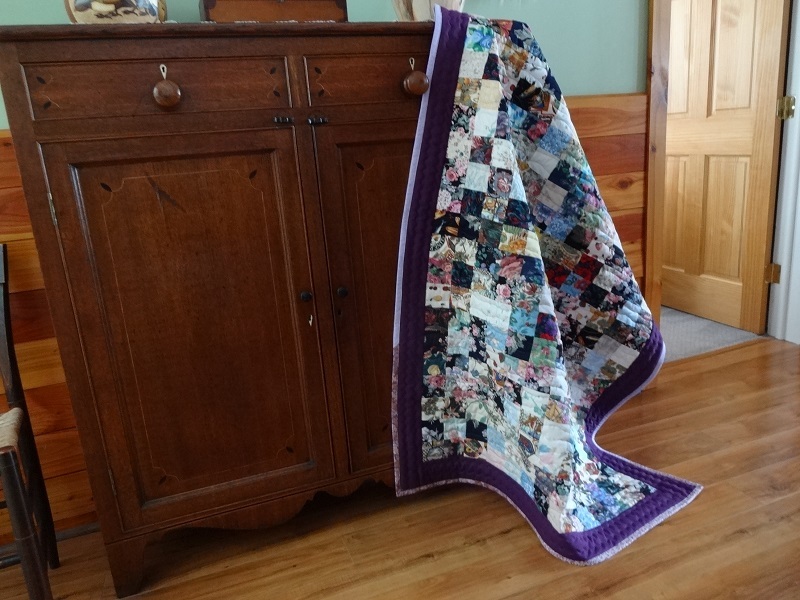 These 'terrible twins' finishes started out as a rather innocent baggie of 3-1/2 inch (more or less) squares donated to our quilt ministry sometime last year. Being under the delusion that I might create something like one of Debbie's wonderful watercolor masterpieces I dove into them early last fall. It was all quite innocent at the time. 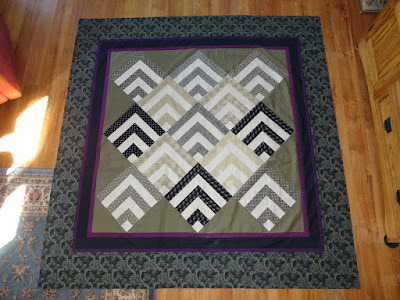 But as soon as I began placing 'squares' on the design wall it became quickly obvious that there were nowhere near enough different prints to make a true watercolor quilt. What to do. After scrounging through the meager 3-1/2 inch squares in the ministry's stash bins, I just started piecing twosies, then adding a square, rinse and repeat, then stitching the threesies into nine-patch blocks. 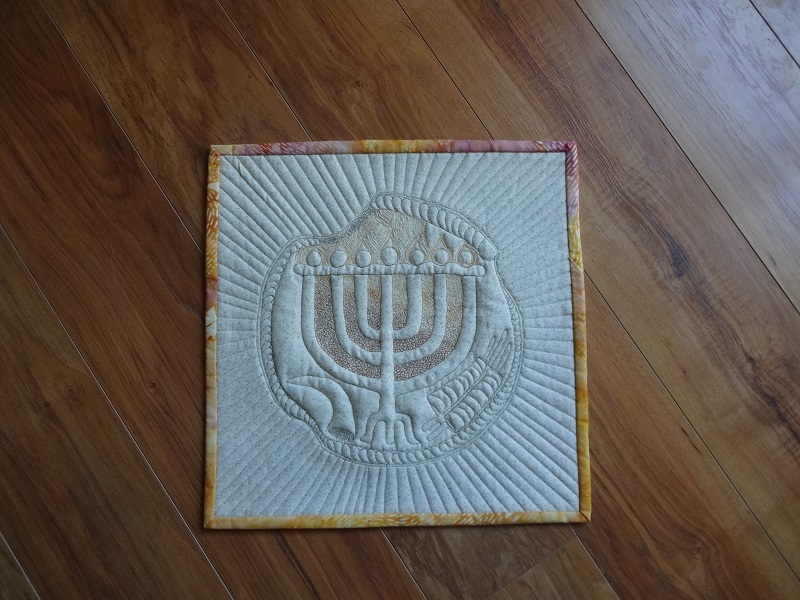 Working on these only during free time at quilt ministry. 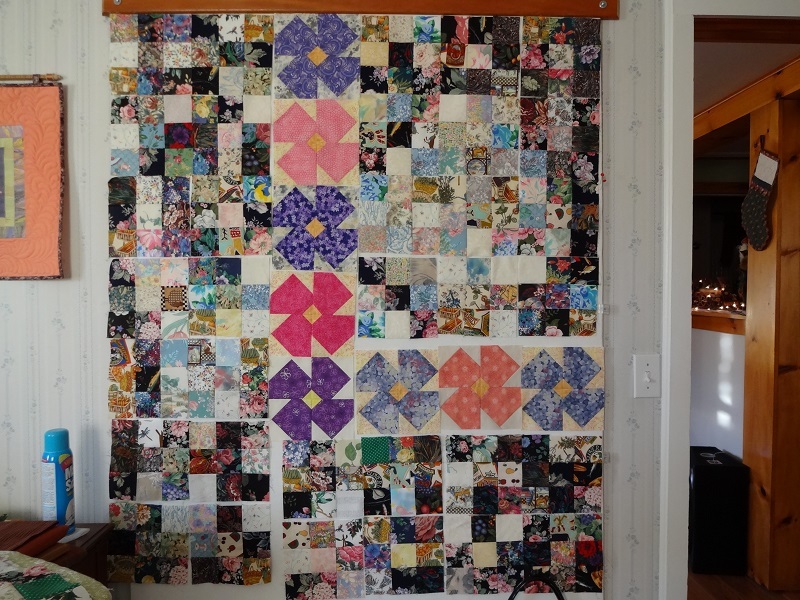 By the end of December most of the nine-patches were finally done. 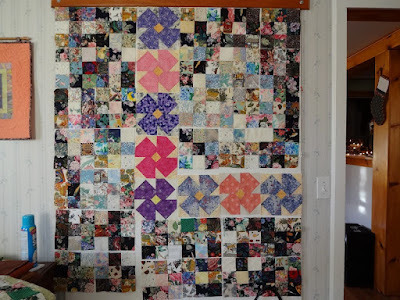 There were a few of these flower blocks that had been made early in our quilt ministry days just sitting on a shelf, so they became part of the mix. Still, this was what was facing me at the end of December. First finish - "Chaos Corralled"
My favorite of the two, mostly because it does ... sort of ... have a bit of a watercolor effect. Be kind, I know you're rolling on the floor laughing! The eggplant fabric did an amazing job of blending well with all the other fabrics in the quilt, though most of these photos show it much darker than its true color. 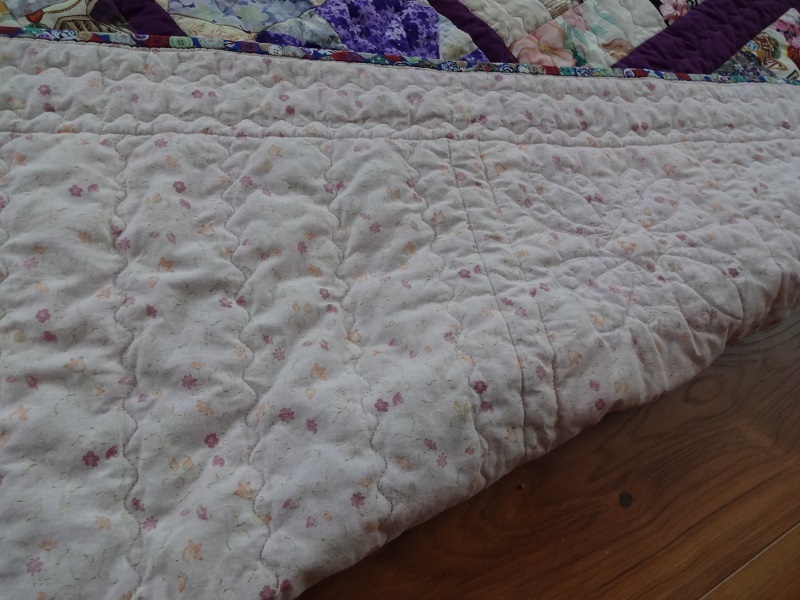 A bit of the back, probably gleaned from a thrifted then donated sheet, faded but still very soft and snuggly. 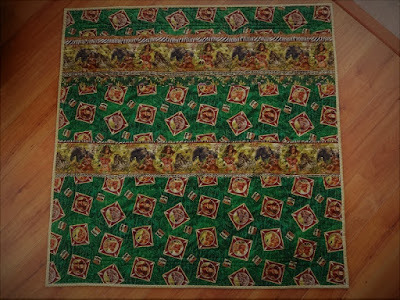 Then, the second of the 'terrible twins', created from all the leftover nine-patches. 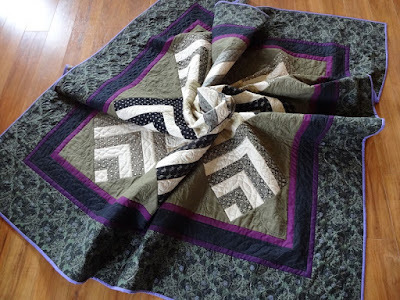 Also known as "Chaos Unleashed," queen of the mismatched seams and ripply scrappy binding. It at least deserved a glamour shot to mask its infirmities. 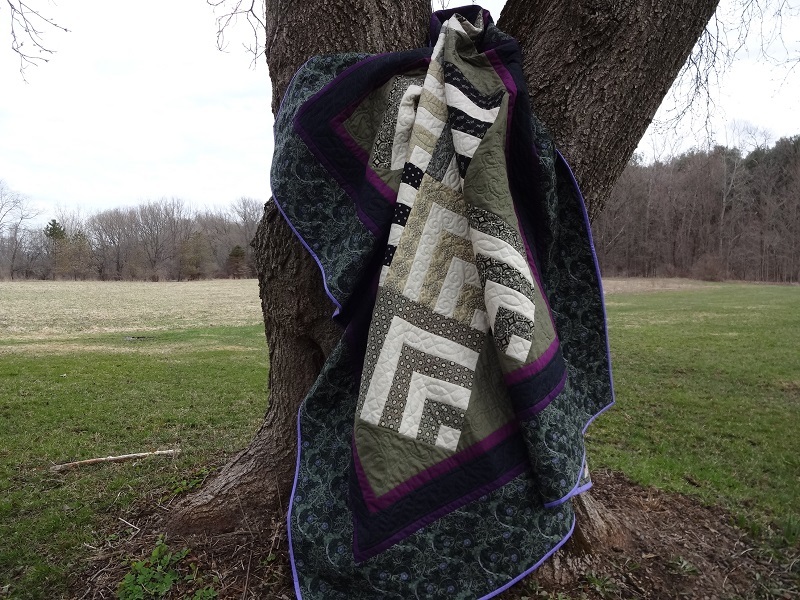 This next shot also gives you a better rendition of the color of that lovely eggplant fabric. 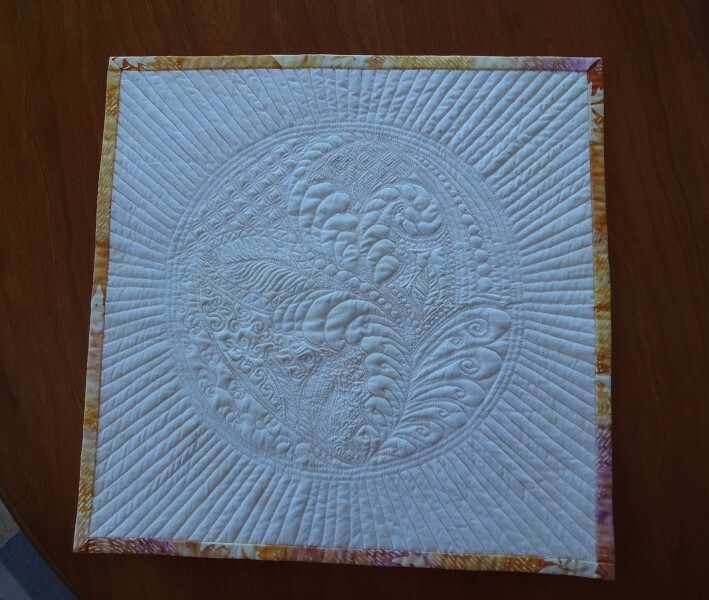 The back of this one is a sweet but thin print that has sat in my stash for far too long. 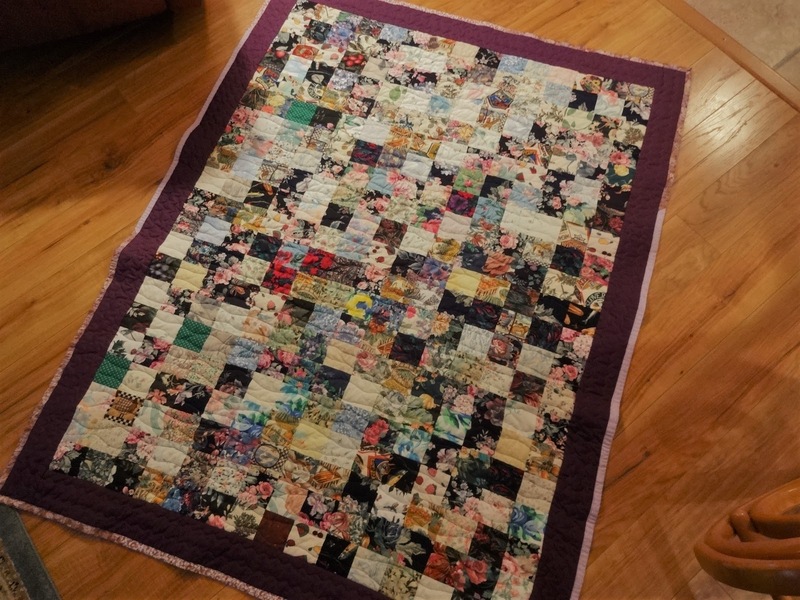 The remaining yard+ has been given to one of our church members with a baby girl, for her Easter dress. Perhaps the thinness of the fabric accounted for the wavy edges/binding. 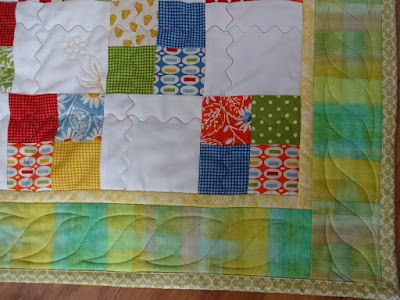 Though I fear it may have been the meandering line quilting, great texture and loft though I'm not sure if I'll try it again anytime soon. 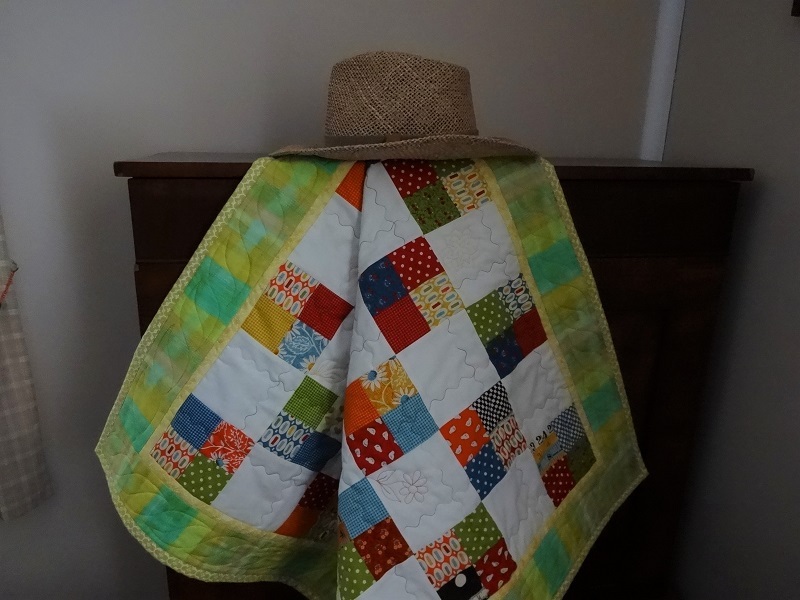 These two are slated to be donated as a need arises, they will make good chemo quilts, or perhaps for a nursing home patient. There are a lot of I-spy squares to be discovered, everything from florals to vegetables, Noah's Ark to fishing gear to wedding rings and roosters! 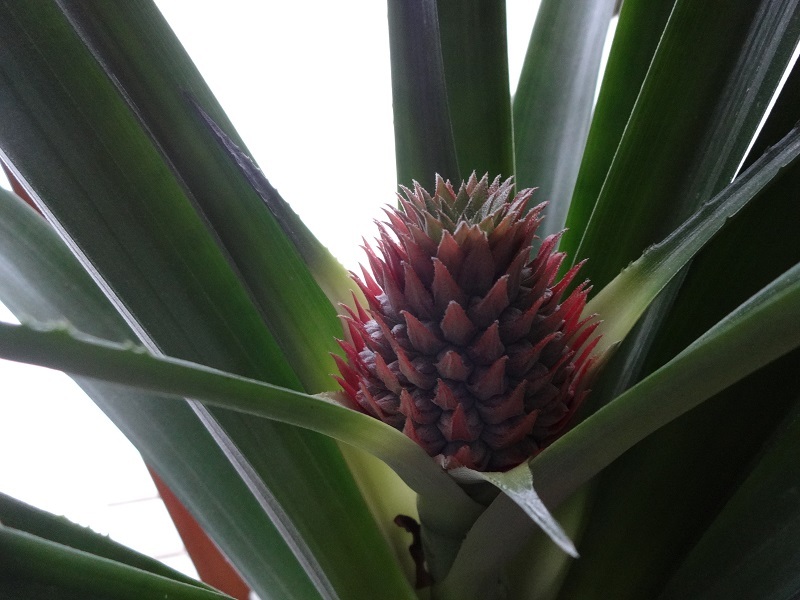 And, if you're still reading, here's the latest shot of the pineapple bud/flower growing in our sunroom. It has grown a couple inches since I last posted a photo. That despite the snowstorm raging (again) outside the window. Til next time, happy quilting! A long time ago when the world and I were much younger, the country-blues-pop singer Rita Coolidge sang a Cajun-inspired song "Sing the Blues, Mama Lou." It was a favorite for a long time, and as soon as I started working with my blue strings, it came to mind once again. I've been humming (or singing when no one else is around) that song ever since. 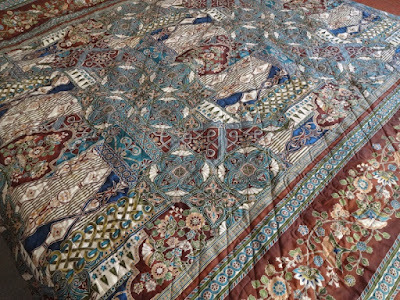 So, I guess this quilt has named itself, Sing the Blues Mama Lou! 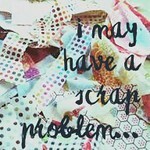 Late last month I had started with a pile of blue scraps, the very day Lori had posted her first link-up. 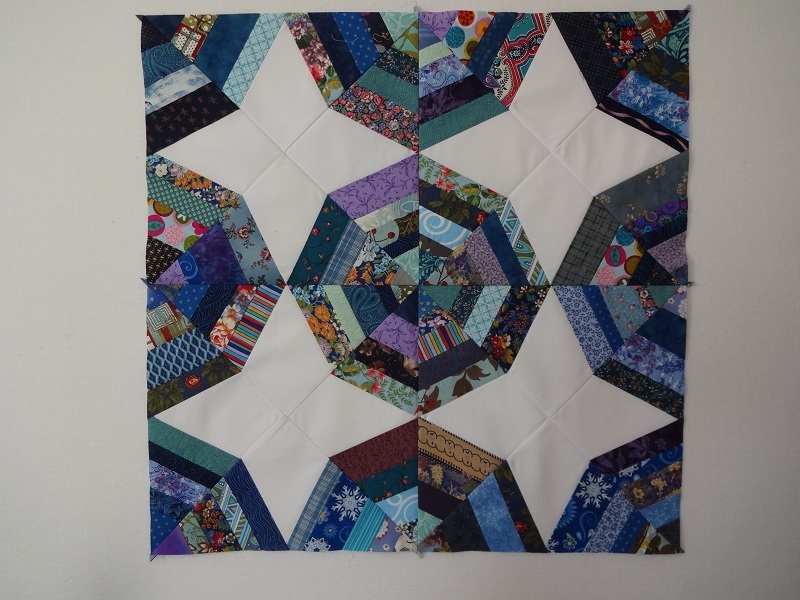 So, naturally not much was accomplished in January, just a pitiful offering though I did join the linkup. 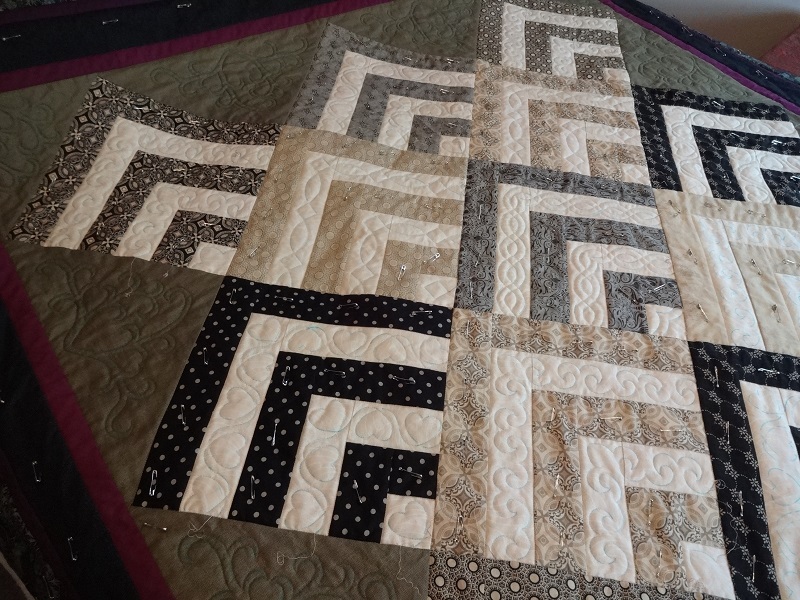 My plan now is to try to get a four block unit completed each month until the quilt tells me it's finished. It now looks like this, with the first four blocks done and sewn together! Actually all that white doesn't look nearly as obnoxious in person as it does in the photo below. While I'm really liking this project, I can already see things I'd like to do a bit differently, so this first four-block unit may end up not being used in the final quilt, but time (and energy) will tell. And there are lots more strings of every color around here, so who knows where this adventure is headed! 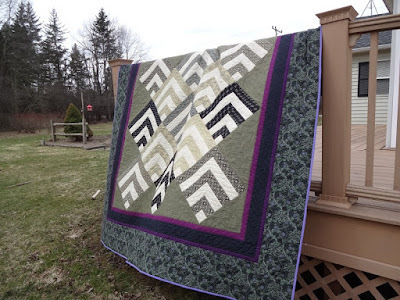 Joining the Stringalong 2019 link-up for February hosted by Lori at Humble Quilts, where you'll find lots more playing with strings inspiration.